PHILADELPHIA (WPVI) -- The Philadelphia Eagles are NFC East Champions. By defeating the Los Angeles Ram Sunday, the 11-2 Eagles became champs of the division. The team's last NFC East title came in the 2013 season. The Eagles' game play and celebrations have been the talk of the football world since they began their NFC East Championship season. 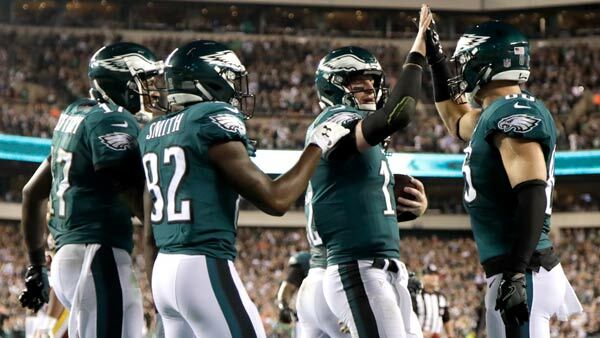 On their way to a 31-3 victory over the Chicago Bears two weeks ago, the Eagles celebrated on the field during the game in multiple ways from the Electric Slide to bowling a strike! Eagles celebrate TD with bowling strike on November 26, 2017. The fun atmosphere of this Eagles team is being embraced by fans in Philadelphia and beyond. One local teacher is giving her students treats after every Eagles win, a teen felt what it was really like to fly like an Eagle, and a Delaware County family is lighting up the holidays with team spirit. Corey Clement's guidance counselor gave her BMW to the Eagles rookie after a promise she made him years ago. Carson Wentz was brought into the conversation when the royal engagement was announced after the Eagles poked fun at his resemblance to Prince Harry. Even, Cleveland Cavaliers star LeBron James, and Dallas Cowboys fan, said Wentz is his favorite NFL player. "My favorite player right now is Carson Wentz," James said. "I told my brother that early in the season that I just love the way he plays the game. The way that he's able to get to progressions throughout the course of a three-step drop or a five-step drop, and if everything breaks down, his ability to run, get outside the pocket, either make passes or get yards with his feet." Wentz suffered a knee injury in the second half of the game against the Rams. But while the Eagles are division champs, some fans are superstitious when it comes to saying that the team is "super." They'll wait a little longer. The Eagles play at the New York Giants next week and return home against Oakland on Christmas night. Is it too soon to talk Super Bowl?